Who lost a tooth? Need a place to put a lost tooth where the tooth fairy can find it. 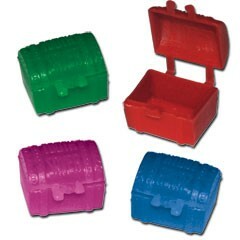 Our colorful assortment of tooth fairy treasure chests make the perfect prize. Tooth fairy treasure chest boxes are priced per box, but are sold in increments of 3 dozen. Please order in increments of 3 dozen.